The Scare. And it was NOT caused by a bear! If you want to skip all the reading, I suggest you scroll down to the bottom of the page for photos. I am relating this story because it was a major experience for me. One thing I learned from it was not to take anything for granted--not be too bold. Up until that night on the Stuart-Cassiar Hwy., I had grown complacent, nothing scared me--I could take care of myself. This experience brought me back down to earth, and reminded me that sometimes there are real dangers to traveling alone. Especially on long, isolated stretches of road. It was here, on the Stewart-Cassiar Highway where I experienced fear like I never experienced it before! All through the entire length of the journey across the US and Canada, I often found myself having to transverse large, isolated stretches of road--it never really bothered me. 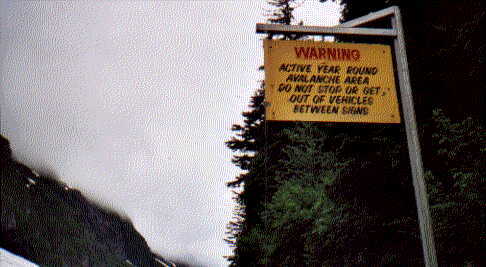 I consider myself a safe traveler, alert, aware of my surroundings--but I made one mistake on the Stewart-Cassiar Hwy. that I will not make again! I should have followed my instinct and not ventured out into unknown territory so late at night. After leaving Slana, Alaska, I continued on Rt.1 and stopped at the Tok Informtion Center to find out the costs & schedules for the ferry services. I was looking for an alternative route back to Washington State. I was still feeling pressured for time. A ferry would be more expensive, but it would save me from driving over a thousand miles back down throught British Columbia--on the same road that I'd driven up on. I found out that the least expensive way to go would be to drive down the Stewart-Cassiar Hwy. to Prince Rupert, and catch the ferry there to Port Hardy on Vancouver Island. Once on Vancouver Island, I would still have to drive down the entire length of the island to catch another ferry to mainland Canada. Gorgeous Dease Lake by the Stewart-Cassiar Hwy. The travel magazine I had with me said that from the junction in Laird (Yukon) to Prince Rupert is 446 miles, "consisting of mostly pavement & sealed dirt, some gravel stretches and a few one-lane bridges ...north of Meziadin Junction...it has few cmmunities along the route, but the drive is a scenic adventure through great tracts of wilderness. Much of the drive is just you, the highway and other adventures you meet long the way." Well, I'll tell you--I met more than just "other adventurers" along the way! Journal Entry: I called Luciano (my son) from a gas station on Dease Lake to say, "Hello". After that I drove for another hour or so. It was about 11 PM and just starting to get dark. There were 5 or 6 Rv's parked in a rest area on the shore of a small lake--a beautiful snow peaked mountain in the distance. This would be a good place to stop for the night. I could get a good picture the next day. So I pulled in for the night. Took all the stuff out of my back seat and layed out the sleeping bag, Got the water jug and was brushing my teeth when an 18 wheeler pulled up and parked right beside my car. Although it was almost 11 pm, it was still light enough to see right into the back seat of my car. Gee, 'ya think he could have parked a little further away? I figured I'd just climb into my back seat & pull the sleeping bag over my head & try to get some sleep. But the truck sat there with their engine on high idle. Hoping they would shut it down eventually, I tried to ignore the noise. Damn, of all places to park! After about half an hour I couldn't take it any longer. So I got out of my car and packed my stuff away. Figured I'd be better off driving up the road a few miles and find a quietier place to sleep. Big mistake! By then it was about 11:30 PM and getting darker all the time. I wondered if maybe I should turn around and go back to the spot with the RV's. Nope. Go forward. About 2 miles down the road there was another "Construction Ahead" sign. The road looked pretty bad. Soft shoulders, no turn-offs, no pull-offs, no rest areas, no lights--nothing. Then I saw headlights in my rear view mirror. I wondered who would be driving a camper down this road this late at night. Some people has since told me that I should have pulled over to the side of the road and see if they wanted to pass. But it was late at night...in the middle of no where. It was safer to just continue driving. Sometimes you just have to trust your instincts. A sign came up on the side of the road--"Next Services 64 Km". But I had learned from experience that just because a sign says, "Services", doesn't necessarily mean that there really are services. It's not unusual for places to go out of business in remote areas like this. I'd seen plenty that were closed. In any case, 64 kilometers is quite a long ride on a narrow mountain road under construction. During the day they use "Lead Trucks" to lead the cars through the construction areas--usually at 25-30 mph. These headlights behind me were making me a little nervous. For the very first time during this trip--I had a bad feeling about this situation. I was driving 25-30 mph and the vehicle behind me was catching up. Not really a big deal. Just thought I'd drive a little faster and leave them behind. A camper or RV would not be able to maneuver the hills and sharp curves, especially in the total darkness over the bumpy "under construction'' road surface. Wrong. I looked in the rear view mirror and their headlights were there again. So I drove faster. Then faster. Now I was getting really scared--only because it was so late, so dark, and the road was so bad. I had no way of knowing how long this construction section would continue. I also knew that when I reached the end of the 64 Km, there was no guarantee that there'd be any RV's or anyone in the area. And who knew how far it would be before I saw anyone else. The headlights were still there behind me. So I drove even faster. Surely no rational person would continue to try to keep up with me. They did. Just when I thought I had lost them--their headlights would peak up over the top of the hill behind me. By then we were driving up to 70 mph on that dark, curvy, unpaved road. By then my knees were shaking. (I learned that knees really do shake when you're really, really scared.). I thought that even if they don't catch up with me, I might get in a car accident. It was pitch black. My car headlights didn't shed enough light for me to see far enough ahead. It's not uncommon to come across a moose or a deer standing in the middle of the road. I thought about all the possibilities. I wondered why this vehicle was keeping up with me. Maybe they were just in a hurry. I hoped that maybe it was a police car chasing a speeder--me. Again I considered pulling over and letting the vehicle go by. But I had the feeling that they didn't want to just "get by. If I stopped my car they could block my way or bump my car. Nope. Not worth taking a chance. If you find yourself in a situation like this--so far out in the wilderness--it's better to be safe than sorry. I kept driving 70 mph. I thought about the conversation that I had had with my son just few hours earlier. I wondered if that could possibly be our last conversation. My imagination went wild. But under the circumstances (even now looking back), I feel that my caution and fears were justified. I had to think of a way to get out of this situation. There was no place to pull the car off the road. Both sides of the road had soft shoulders and no place to pull into and shut the lights off until the vehicle passed. And when there were not soft shoulders on both sides of the road, there would be a ledge or river on one side. Then I thought that maybe, if I could go a little faster, I could get far enough ahead of them so that when I went around a curve (so they could not see my tail lights) I could pull a fast u-turn. I'd have to pull a 3 or 4 point turn because the road was so narrow. I had to try it. It was just a matter of time before they caught up with me, and it would be too late to try the u-turn without them seeing me. I drove faster and strained my eyes to see through the darkness beyond my headlights, looking for the next curve. Then a fairly good sized curve came up. As I turned into it, I looked into the rear view mirror, and could not see their headlights--so I knew they wouldn't be able to see my tail lights for a few seconds. This would be the place where I'd make my turn! Stepped on the brakes, and shifted the stick shift like hell! But careful & controlled. Reverse. Forward. Reverse. Forward. I had to complete the turn before they came around the curve. I couldn't let them see me. Completed the turn and started driving at a normal rate of speed toward their direction so they would think that I was just another car going by. A few seconds later they whizzed by! It was a white panel truck with a right tail light burned out. What a relief! I hoped that they would continue to think that I was ahead of them. For now I was safe. I turned my car around and continued on my way. I wasn't going to drive back the way I came even though I was a bit worried that they might figure out that I pulled a u-turn to lose them--and they could possibly be waiting up ahead somewhere. So I knew I wasn't out of the woods yet. But I was immensly relieved that they were no longer speeding after me at 70 mph! At the end of the 64 Km was Meziadin Junction. It was well after midnight. What a relief--there were 5 or 6 RV's parked in the closed gas station/restaurant parking lot. I squeezed my little car right in the middle of them, quietly slipped into the back seat and went to sleep greatly relieved, thankful, and exhausted. But the story doesn't end there. I woke up early, and moved my car to the front of the restaurant and waited for it to open at 7AM. Went in for breakfast. There was a "missing person poster" on thr wall right by the door. A 29 yr. old man had been missing since June 8. (Today's date was June 20th) The poster described the man, and said that he was not the type of person to just disappear without telling someone where he was going. Neither he nor his vehicle had been found. While I was having breakfast a gentleman sat down with me for a few minutes. He worked at the Hyder information booth across the street. We had coffee together and talked. I told him what had happened the night before on the road. He said it was "probably nothing" just some people in a hurry. 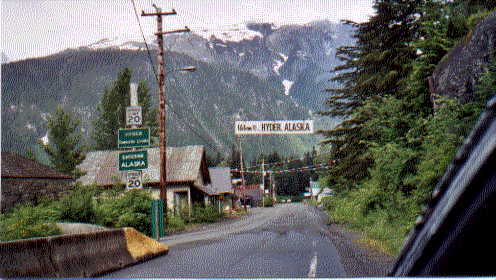 After I left Meziadin Junction, I drove 40 miles to Hyder, Alaska. Stopped at a gift shop to buy some postcards. There were two young girls working. One of them asked me if I'm ever afraid traveling so far alone. I told her that I had never been afraid before--until after what happened last night on the Stewart-Cassiar Hwy.. I told them the whole story. The other girl seemed defensive. She said she had driven that road for years and nothing like that ever happened to her. She said that someone must have been in a rush just like I was. I told her, "No, I wasn't in any rush, I was speeding because they were keeping up with me." I explained to her that I would never normally drive like that especially at night on a mountain road. Then she said that it was probably someone just having some fun with me. Hmmm. I could see the conversation was going nowhere. I started to think that perhaps the man at the Hyder information booth and the girl at the gift shop were right--maybe I was just making a big thing out of nothing. Didn't speak about it again until I got back to the hostel in Birch Bay. A woman there told me that the bodies of 3 teenagers were found in in Kitiman. The killer was not found. I checked my map. 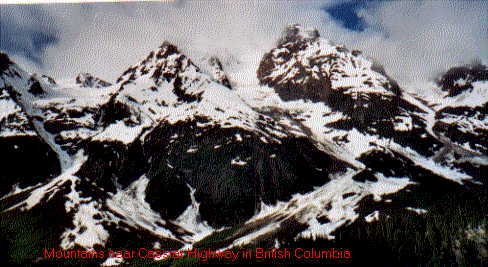 Kitimat is on Rt 37, the Stewart-Cassiar Hwy. not far from Meziadin Junction. That was kind of creepy to hear. I started to think that maybe I should report the chase incident to the Canadian authorities, but then, I thought maybe it was nothing. I felt that it would probably be treated with skepticm--just like it was when I told the people in Meziadin Junction and in Hyder. So I let it drop. But as the weeks passed, it stayed on my mind. When I got home in July, I searched the Internet to see who I should report it to. Better late than never. So I reported it, and that's that. Now that I've got that off my chest--back to the road trip! Right: Tourist Information Cabin across the street from the gas station/restaurnat where I slept in my car in Meziadin Junction. You have to drive through British Columbia to get there. Check the map well, Rt. 37 is a sharp left. Miss it, and go straight you end up on Rt. 37A which will take you 40 miles out of your way to Hyder. Then you have to turn around & drive back 40 miles to get back on Rt. 37. But it's worth the detour. The mountain & ocean views are great. 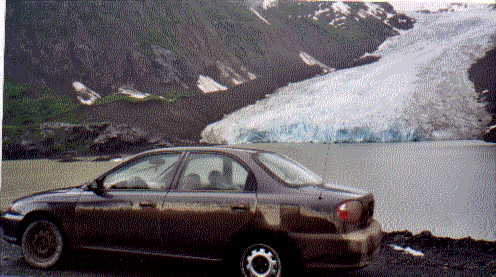 And I even got a picture of an avalanche and a close-up picture of my car in front of a glacier. Left: Avalanche warning sign. I did stop & get out of my car between signs. It looked safe. Damn, this camera takes some bad pictures sometimes--well, I suppose I could have something to do with it. Whoa! I like that! Look at that blue ice in the glacier. Look at that filthy car. It had been through a lot. Yep, that car can hug corners on those dirt roads going 70 miles an hour in the dark! Man, I love that car! Sorry...I got carried away. Left: Driving down Rt. 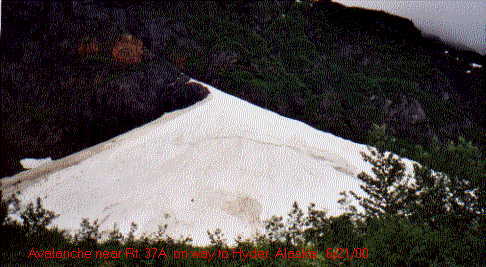 37A from Hyder, Alaska back to Meziadin Junction and Rt 37. This is the view from Rt. 37A -- Look at those mountains! Just breathtaking! 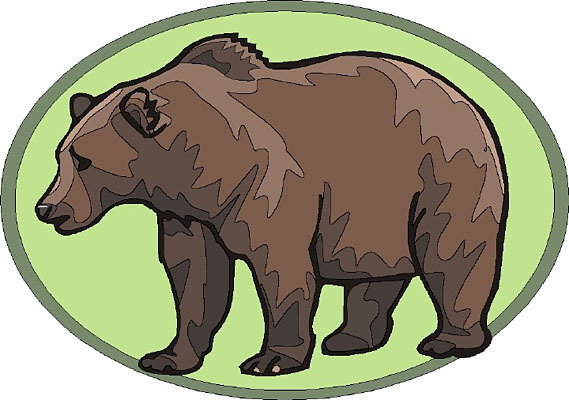 Right: Here's three pictures of the same bear. I took the photo from my car. 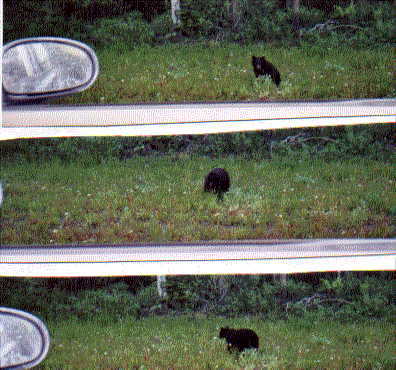 The bear was eating dandilions. Above: Finally made it to Prince Rupert, BC to catch the early morning ferry to Port Hardy on Vancouver Island. It was pouring out. Had to pack the tent away soaking wet. Oh well, won't be the first time! 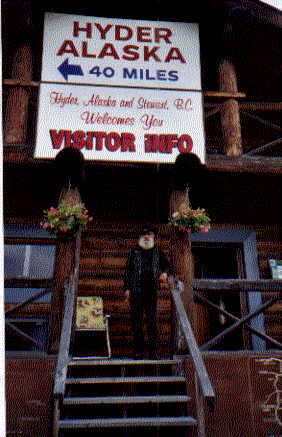 It had been an unbelievable & unforgettable journey through British Columbia, the Yukon, and Alaska. I'm sooooo glad I decided to take this "side-trip" to Alaska and I wouldn't hesitate to do it again! 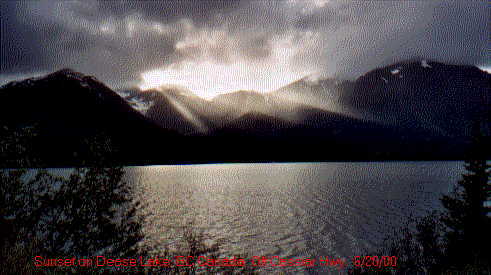 Here's a web site I just found that shows maps and distances in this gorgeous Cassiar Area.